Emerald Creek Dares: Yes, Rocks can be Embossed! Anyway, after the rock stamping going so well, ideas started to flow, Can I use embossing powder on a rock? The answer is Yes, but it's tricky. A rock is super porous so ink soaks in way too fast for the powder to stick. it also wicks the water away, making the powder plow off before it go hot enough. Well, it took a couple attempts but the best result came from the finest powder parts of the Burnt Copper Leaves and a juicy archival ink. It has to be really wet but still can hold detail (the emboss it dabber was too gooey and lost the detail). Have all these items on standby, paper to dump the powder on and push aside, clicker for a strong consistent flame, ink and stamp, clean rock & embossing powder. Saturate the stamp with the ink pad by dabbing the ink onto the stamp. Stamp the rock, apply pressure the get the image over the bums, dump powder over the image then dump the rock onto the Paper. Then use the clicker flame and heat that rock image quickly. I have not tested white powder, I am sure it will burn, but with Canada day, I am going to try anyway. Flick off any bubbled up pieces, what remains is not coming off. Then I turned to my alcohol inks for a water coloured look. 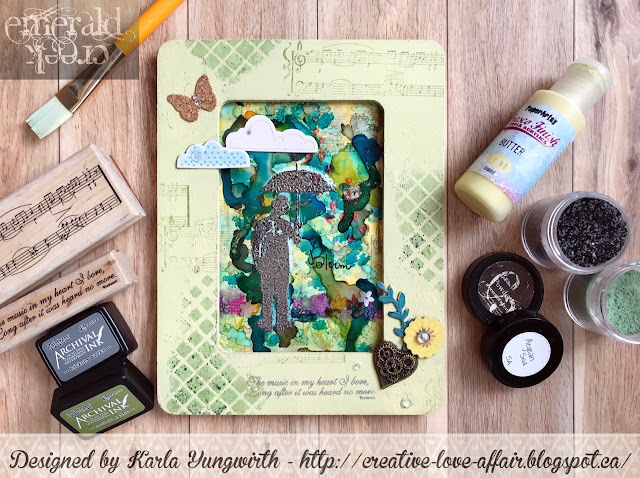 squeeze a few drops onto your craft mat and pick up with a brush and start painting. Let dry, the look will change as the alcohol dries off. Viola, another piece of Rock Art for the garden. I can't wait to see what happens to these over the summer with the elements. I don't know what's wrong Kim, but I can not see any pictures, not in Feedly, and not on the blog. Don't know whether it's just me? !